Today I made a very VERY simple set of primitive wood candles. Well, their just for looks since there's no actual light or flame. But they were cheap, cheap as in FREE and very easy to make. I started off the day by cleaning out my neice and nephews' playhouse we built for them here. 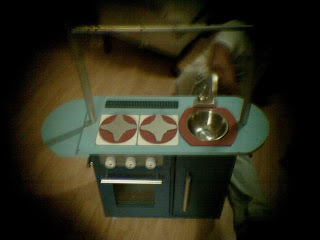 Well, there was an old kitchen play setthat had the sink/stove combo that had to go. There were four. I didn't know exactly what to do with them, but I brought them in anyways and threw most of the rest of the kitchen play set away. 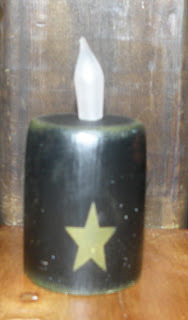 Then I started painting them black and thought, "hum, they'd make cute fake candles." So I painted them all black and added some primitive styled stars and painted the edges a bit. I took a small flat nail and drove it in the top of the wooden leg. And used that to slip the fake flame over. 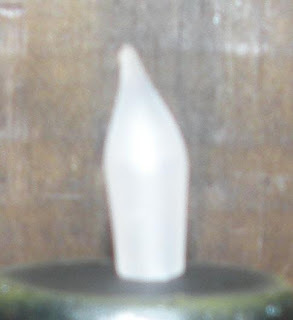 It didn't hold great, so I stuck a shot of hot glue up in the flame and then stuck it back over the nail and wa~la. Tight hold. And that's it. A cute set of primitive styled, wooden candles for free. TIP: Ya'll keep an eye out for wooden legs off of toys or old pieces of furniture. You can make numerous amounts of crafts with them. And if you go buy them plain at Lowes or a hardware store, you'd be surprised at the cost of plain wooden legs! Loving this idea which is great for those who aren't fans of traditional candles.